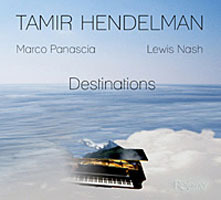 This is quite an unusual debut, since Israeli-born pianist Tamir Hendelman already had an international reputation years before this first CD as leader. A longstanding anchor of two famous bands (the Jeff Hamilton Trio since 2000, and the Clayton-Hamilton Jazz Orchestra since 2001), Hendelman is increasingly busy as arranger, sideman, and accompanist for singers such as Natalie Cole, Roberta Gambarini, Tierney Sutton, and Jackie Ryan. But perhaps the best recommendation of all comes from keyboard legend Oscar Peterson: after witnessing Hendelman's interpretation of Peterson's own "Canadiana Suite," Peterson described the younger man's playing as "exhilarating, invigorating, and thoughtful," and said that he was "refreshed" by Hendelman's "inventive passages." This rare ability to invent "refreshing" passages is one of Hendelman's major gifts. It's not just a matter of avoiding cliché, his arrangements and solos are distinctive and compositional, while still respecting the integrity of the original. In particular, his imaginative use of harmony, syncopation and dynamics transforms a well-known and well-done tune into something rare. On Playground, he's also written a number of unison passages for piano and bass that appear throughout the music, showcasing both Hendelman's creative imagination and the incomparable technique of John Clayton. Playground is a good title, since this CD is exactly that: a space for exploration, discovery and fun. Hendelman's compositions are intelligent, melodic, and varied: he offers the luscious "Almost Summer," the impish title track, the angular "Tiger's Lair," the restless "Spring Action," and the quietly grand "Sycamore." Other delights include the trades between Hendelman and drummer Jeff Hamilton on "I'm Old Fashioned," which somehow conjure a dapper, dancing Fred Astaire; Hendelman's novel, bluesy approach to "Do Nothing Til You Hear From Me," and his un-sentimental take on "I'm Getting Sentimental Over You." On "The Cape Verdean Blues," he pares Horace Silver's tune to its rhythmic essence, then takes all the muscular splashing out of "Singin' in the Rain" to expose its surprising sweetness. Hamilton's brushwork is as classy and swinging as ever, while Clayton's exquisite arco adds a deep, lustrous sheen to "It Never Entered My Mind." It has been argued that a rhythm section composed of John Clayton and Jeff Hamilton would make a barking dog sound beautiful; certainly their level of artistry sets them apart from most players, living or dead. But Hendelman is fully up to the challenge, providing arrangements and compositions that make the most of this trio and their long history of warm collaboration. And in the process, Playground confirms the arrival of a brilliant "new" talent. Track Listing: Driftin'; I'm Old Fashioned; Playground; Sycamore; Tiger's Lair; It's Only a Paper Moon; It Never Entered My Mind; Do Nothin' Til You Hear From Me; Spring Action; Singin' in the Rain; I'm Getting Sentimental Over You; The Cape Verdean Blues; Almost Summer. 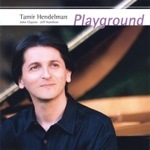 Personnel: Tamir Hendelman: piano; Jeff Hamilton: drums; John Clayton: bass.